Homeopathy, which is an alternative therapy based on the theory that "like cures like" was developed in the late eighteenth century. 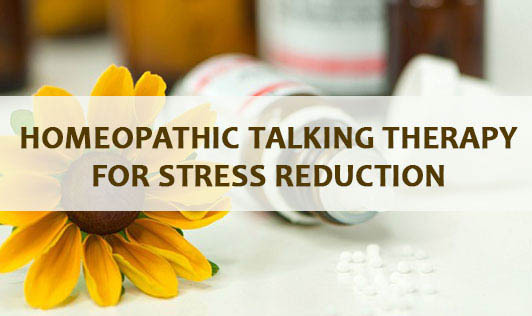 As a part of homeopathy, talking therapies are used to reduce stress. Talking about your thoughts and feelings can help you deal with times when you feel troubled about something. If you ponder about a worry over and over in your mind, the worry can grow. But talking about it can help you work out what is really bothering you and explore what you could do about it. Talking therapies involve talking to someone who is trained to help you deal with your negative feelings. They can help anyone who is experiencing distress. Talking therapies give you a chance to explore their thoughts and feelings and the effect they have on your behavior and mood. Describing what's going on in your head and how that makes you feel can help you notice any patterns which, if changed might be helpful. It can help you work out where your negative feelings and ideas come from and why they are there, & to then make positive changes by thinking or acting differently. Tis can help you to take greater control of your life and improve thyour confidence. Talking therapies are not therapies that are ‘done' to you by someone else. You play an active part in the therapy. That can be empowering at a time when you may feel you have lost control over a part of your life. If you are determined to get the most from the therapy, it is more likely to work. Talking therapies require you to be completely honest with yourself and that can be difficult. It may mean facing up to your fears, recalling distressing memories or talking about intimate topics and private thoughts and feelings. Sometimes it is enough to just talk about one's problems to feel more relieved and to realize all of a sudden that the serious problem you thought you had is not so serious, or you find that the problem can be solved. You just have to want it. But talking to a therapist about these problems is another form of stress relievers and sometimes helps maybe even more than talking with a family member or friend. The therapist usually knows better about stress, is better prepared in what concerns this problem and can help you find what might be the best solution for your state.